Ahmedabad: Twelfth batch of the Indian Institute of Management, Ahmedabad (IIM Ahmadabad)'s one year full time residential Post Graduate Programme in Management for Executives (PGPX) for 2017-18 was inaugurated on Thursday, April 13, 2017 by Director, Professor Ashish Nanda. One hundred and fifteen students have joined the PGPX-XII batch. The 2017-18 batch has an average GMAT score of around 700, average age of around 32 years, average total work experience of 8.5 years, and average international experience of two years. The current batch is also very diverse in terms of educational backgrounds (25% are non-engineers), work-experience (18 industries, innumerable functional areas, and 102 companies), nationality (three international participants), gender (25% of the batch are women), and international work-experience (57% of the batch has worked abroad before joining PGPX), said a statement from IIM Ahmedabad. This programme was launched in 2006 and more than 900 students have graduated from PGPX so far. Till 2016-17, the PGPX intake was 90. This year the institute has added one more section to enhance learning experience of participants. Accordingly, 115 students have been admitted this year. Professor Sunil Sharma, Chairperson, PGPX, in his welcome address, exhorted the incoming batch to focus on learning. "To me, everybody who is part of IIMA family is privileged. Use this opportunity to give expression and lift to your wings. Many have done this before you and they have emerged from this "tapovan" and "tapasya" to become extraordinary problem solvers and leaders", said Professor Sharma while speaking on the occasion. 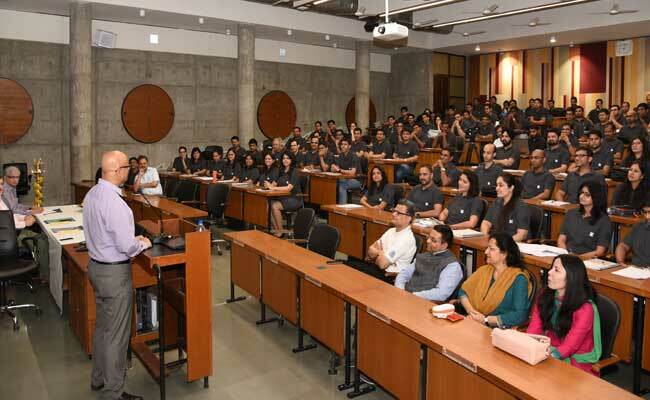 Prof. Errol D'souza, Dean Faculty at Indian Institute of Management Ahmedabad (IIMA), New campus also welcomed the students who have been admitted this year.